Can you post some pictures so we know exactly what you are talking about? Is it rust through or just surface rust? With the dustless blasting I don't believe you would need to remove the tires, so after blasting you could spray on a clear coat. Check in your area for someone who does "Dustless Blasting" they should be able to remove the failed coating and the corrosion. Or check with someone that does powder coating they may be able to clean them up and then clear powder coat them. Take it back to the alignment shop and tell them it is still pulling to the right and see what they have to say. With those miles you should also check for worn suspension parts. I bought my 2011 in April of 2017 with 2,500 miles on it. I bought a Diablo Tuner that allowed me to disable the AFM and then got a Diablew Tune to help with shifting and performance. I'm very happy with it! Congratulations on your find! Post some pictures. paint Chevy Truck blistering and pealing of Clear Coat Paint? On my 2006 Victory Red Silverado crew cab the clear coat started peeling, on the roof only, after about 9 years. The truck was not garaged and had about 75,000 miles on it when I traded it in, in 2017. I bought my 2011 a little over a year ago with 2,400 miles on it. My truck was doing what you are talking about quite a bit. The more I drove it the less it seemed to occur (possibly a computer learning process??) and I also got a Diablew Tune which also seemed to help a lot. It still happens every once in a while but not anything like before. call Weathertech at (800) 441-6287 and see what they say. They have mats for your truck but they say they aren't recommended for vehicles with vinyl flooring. It could be because they would slip around because of the nubs on the bottom of the mat that would normally bite into the carpet. Those could be removed to minimize any slipping. I don't think it is ever to late, unless it's after a failure. I purchased a Diablo tuner. That way I could turn off the AFM and tune the truck etc. Check www.Rockauto.com I think you will find what you need. Interested in the catch cans, sent you a pm. Currently have a chip in my windshield that is not in my line of sight ( it's just above the wiper on the drivers side, had it repaired, you can still see it but it hasn't spread. If it was higher I would have the windshield replaced. 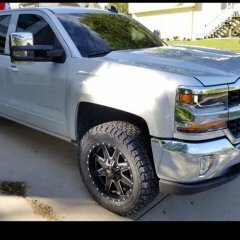 I have a stock 2011 Silverado 5.3 with 6,300 miles on it. I just returned from a 1600 mile trip to Canada and back and noticed that at times the voltage would slowly drop to about 12V and stay there for a while (15-20 minutes) and then slowly climb back to normal. No adverse affects were noticed when this occurred several times during the trip. Any ideas as to what might be causing this?